The advantages of digital radiography over conventional film based radiography are numerous. These advantages include virtually instantaneous image review (no more waiting for film to be developed), improved lesion conspicuity (utilizing post acquisition image manipulation), and reduced radiation exposure to the patient and veterinary personnel. In addition to these advantages, the digital images are more easily distributed to clients, referring veterinarians and off site specialists for review. 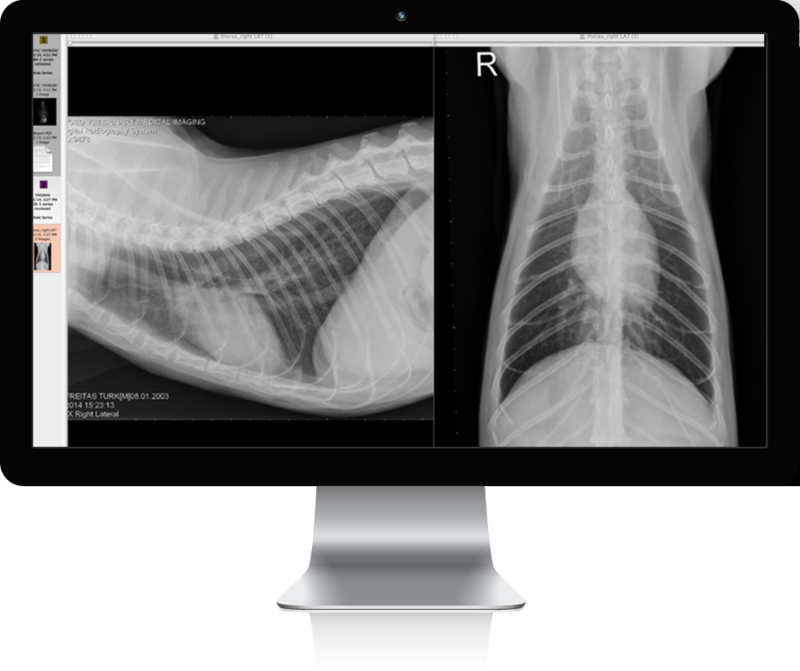 Veterinarians considering the transition from traditional film based radiography to digital systems have a lot to consider. There are 3 different types of digital systems available including Charge Coupled Device (CCD), Computed Tomography (CR) and true Digital Radiography (DR). Different systems offer different advantages. CCD based systems rely on the same technology as is used in digital cameras, are the least expensive and typically have the worst image quality. Computed Radiography or CR systems are intermediate in cost and offer many of the advantages of digital radiography but rely on the use of photostimulable phosphor plates that require processing in a digital reader. This step in image acquisition is similar to processing of the film in traditional radiography and delays image review. The true Digital Radiography (DR) systems are the most expensive but offer all of the advantages of digital including the best image quality. “AVMI’s goal is to provide the best in diagnostic imaging for our patient’s and their referring veterinarians,” says Broome, “With our new Eklin DR system we are confident that we will continue to be able to do this well into the future.” The digital images acquired at AVMI can be easily distributed to clients and referring veterinarians by numerous electronic methods including email and ftp as well as hard copy output on CDs or even good old-fashioned film.